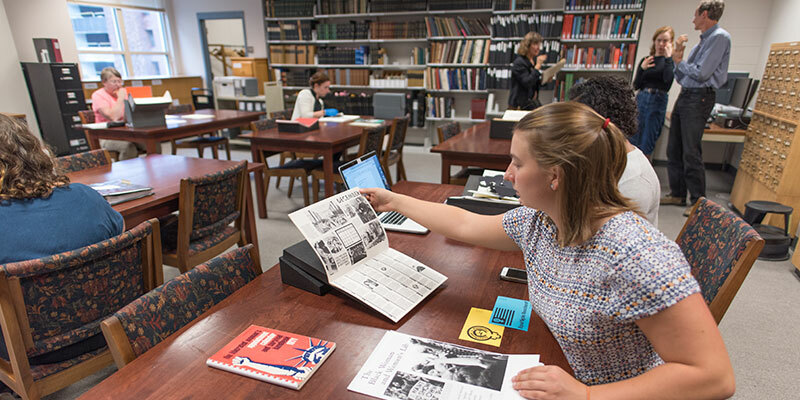 Materials from the College Archives, Mortimer Rare Book Collection, and Sophia Smith Collection are available for use upon request in the reading room. Registration is required upon arrival for all visitors and guests. Special Collections is committed to ensuring equal access to the campus, guests, and visitors of the reading room. Researchers needing accommodations can request them upon entering the reading room, or are welcome to contact our administrative assistant in advance of their visit. Non-flash photography of materials is allowed during your research. Special Collections has two document cameras (see Document Camera Instructions for more information), two iPads, and speciality lighting available for researchers on a first come basis. Please speak to a staff member for more information. Special Collections has a mircoform reader within the reading room. Anyone is able to use the microform reader as long as they ensure the safety of the materials and of the reader. The machine can be used to read microforms, create PDFs, copy/email PDFs, and print. Printing under 40 pages is free; Special Collections charges $0.05 per page after 40 pages and accepts cash and card for this payment. Special Collections welcomes anyone to use our collections, regardless of background, age, affiliation, or the nature of your research. In order to preserve the unique materials we steward for future use, researchers must abide by the policies and procedures of the Reading Room. Special Collections reserves the right to ask a researcher to leave if the policies are not adhered to. Please read our policies prior to your visit. First time users must complete a research registration form; returning users must check in with a staff member. Please leave food, drinks, coats, umbrellas, bags, pens, and laptop cases in our locker area. Please check-out with a staff member prior to exiting the reading room for the day. Researchers can discuss their research interests with any staff member on duty. Feel free discover our collections prior to traveling to the reading room. Special Collections is readily available to provide one-to-one consultation on research projects at any stage of the research process. Feel free discover our collections prior to contact our Reference Archivist with more detailed questions. Some materials are restricted due to issues of privacy, state and federal regulations, and issues of fragility and preservation. These restrictions are noted whenever possible. A small portion of our materials are located off-site and require 48 hour notice for retrieval. Some audiovisual materials also require advanced notice to access due to specialty equipment or the need for reproduction prior to viewing/listening. This may cause a delay in your research. Please contact our Reference Archivist to request off-site materials or with questions regarding audiovisual materials.